Los Angeles can be a pricey destination to visit, but there are plenty of free attractions in the city if you're on a budget. Luckily for visitors, many of the most famous sights in the city do not charge admission. Once you add the city's stunning free beaches, numerous public gardens, and the myriad of entertainment options, it's easy to see how you can visit the City of Angels without spending a dime. Going to the beach is one of the most popular free activities to do in L.A., and with over 70 miles of beach, you can find one to suit your tastes from sandy, calm, crowded beaches to remote, scenic, rocky beaches. There are dozens of beaches, all free, but not all have options for free parking. Perennial favorites like Santa Monica can get overcrowded, but if you head further north toward Malibu, you'll find more secluded options. The Griffith Observatory, located in Griffith Park, has a free astronomy museum and offers visitors a free glimpse at the cosmos through their super Zeiss telescope. Get in line before dark if you want a look at the night sky, especially in summer. They close the line at a certain number of people. Attend a TV show taping of your favorite sitcom, game show, talk show, or reality show, or even one you've never heard of, which can be just as fun. Plus, it's a great way to see celebrities in L.A. Most studios are actually smaller than they appear to be on television, so attending a taping is a truly unique experience. Visit the Forecourt of the Stars at TCL (formerly Grauman's) Chinese Theatre on Hollywood Boulevard to measure your hands and feet against the footprints and handprints of Hollywood legends. Douglas Fairbanks, Mary Pickford, and Norma Talmadge were the first to provide their footprints on the theater's opening day back in 1927. Meander along the Hollywood Walk of Fame to find the stars of your favorite celebrities. The Walk of Fame runs east to west on Hollywood Boulevard from Gower Street to La Brea Avenue and North-South on Vine Street, from Yucca Street to Sunset Boulevard. Take a look at the world-famous Hollywood sign from the viewing area at the Hollywood & Highland shopping and entertainment complex next to ​Grauman's Chinese Theatre. Another good viewing point is looking up Gower Boulevard. The sign itself is fenced off from the public, so there is no legal access to it. The La Brea Tar Pits in Hancock Park next to the L.A. County Museum of Art is the most significant source of prehistoric fossils ever excavated. These fossils have made their way into museums around the world, but the largest collection is here at the Page Museum. It's free to wander the park and look at the tar pits and outdoor exhibits. During the summer, you can watch the excavators at work. Explore the Mexican marketplace at El Pueblo de Los Angeles Historical Monument at Olvera Street. A free walking tour is offered Wednesday through Saturday from 10 a.m. to noon, while a self-guided tour brochure describing the historic buildings is available at the information desk in the Plaza or at the El Pueblo Visitors Center. The Getty Center, a modern hilltop fortress in Brentwood, houses one of the finest art collections in the world and has manicured gardens with stunning views of the city below. The building and view are worth a visit even if you're not interested in the art. While the museum is free, parking can be expensive, although the city bus stops at the gate. The Getty Villa is the permanent home of the J. Paul Getty Museum's Greek and Roman art collection. The Malibu mansion was modeled after the partially excavated Villa dei Papiri in Italy. Located on Pacific Coast Highway north of Sunset Boulevard, the museum is free but advanced, timed tickets are required. There is a fee for parking. The Broad, a new museum of contemporary art, was created by philanthropists Eli and Edythe Broad to house their extensive collection and visiting exhibits. Located in downtown L.A. next to the Disney Concert Hall and across from the Museum of Contemporary Art, the Broad is completely free to visit—although, given its popularity, you may want to reserve your tickets in advance. The California Science Center in Exposition Park is fun for adults and kids. In addition to all kinds of science exhibits, they have the Endeavor Space Shuttle on display. While general admission, there is also a fee for the IMAX Theatre and special attractions. Weekday mornings are crowded with school groups, so afternoons and weekends are better to visit. Performances at the Los Angeles Music Center and Disney Concert Hall may be on the pricey side, but you can tour the Music Center campus including Frank Gehry's metallic masterpiece sailing down Grand Avenue. The inside of the Walt Disney Concert Hall is great, but my favorite thing is climbing up on top among all that metal, and you can do that even if there's no tour. The stairway to climb up from the outside is on Grand Avenue, to the right of the side entrance, behind a wave of metal. The Annenberg Space for Photography is a free high-tech photography museum in Century City with temporary exhibits of photography by world-renowned photographers. They also have a free speakers series. Bergamot Station is a complex of art galleries in a former trolley turnaround station in Santa Monica. It's also the home of the Santa Monica Museum of Art. The galleries are free to visit. Parking is free, and there's a metro station nearby. 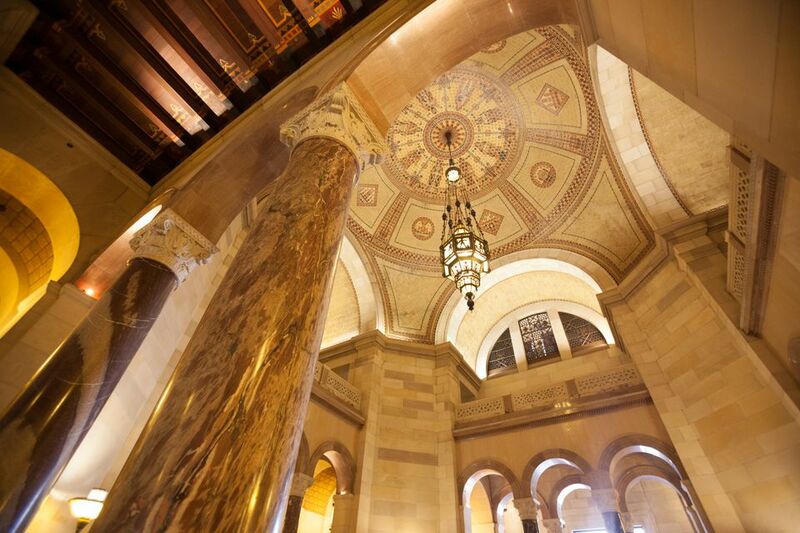 Los Angeles City Hall is free to visit during regular business hours. In addition to the dome that you can see from the third and fourth floor, there's a 27th-floor observation deck that's also free to visit. The Bridge Gallery at City Hall showcases art created in various city-run programs or exhibits related to the city's various Heritage Month Celebrations. The downtown L.A. central library is worth a visit for its architecture, public art, gallery shows and public programs, but it's not the only interesting library around. The West Hollywood library also has some interesting art, including a molded wood ceiling installation and numerous murals by well-known artists. They also have a full calendar of family programming, including literary events, music, staged readings and theatrical performances. Amoeba Music in Hollywood, a mecca for fans wanting to actually buy music—from CDs to vinyl and cassettes—regularly hosts free in-store concerts. Space is limited, so it's good to be there early. There's plenty to keep music fans busy with free listening stations around the store. Additionally, the Record Parlor is another Hollywood used music and memorabilia store that hosts free concerts.​ Fingerprints music store in Long Beach, another destination for vinyl seekers, also hosts free in-store performances. Take a Free Art Walk All Over L.A. There are galleries and art districts around L.A. that you can visit and explore for free any time, but during monthly and quarterly art walks, all the galleries have receptions at the same time, music and food are added to the mix, and crowds of people come out to enjoy. Laguna Beach host theirs monthly, on the first Thursday of each month, while others, like Abbott Kinney's, in Venice, are held on the first Friday. Many of the most beautiful gardens in Los Angeles charge a fee, but there are also lots of gardens you can visit for free. The Rose Garden at Exposition Park near Downtown LA is always free, as are the beautiful Greystone Mansion Gardens. These are owned by the City of in Beverly Hills and are open to the public daily unless they're booked for a private event. The Mildred E. Mathias Botanical Garden at UCLA is a teaching garden. It is free to visit. Free docent-led tours are offered the first Saturday of the month at 1 p.m. Free group tours for 10 or more can be arranged with two weeks notice. Additionally, the James Irvine Japanese Garden at the Japanese American Cultural and Community Center (JACCC) in Little Tokyo is free to visit. The JACCC also has free exhibits on Japanese, Japanese-American and multi-ethnic art. The Metropolitan Transit Authority invested a lot of money and effort to identify and contract talented artists to create art installations for the Metro transit stations. You can take a free Metro Art Tour of art along the Red Line Route between Hollywood and Downtown LA, including a tour of the historic Union Station. Some tours start in Hollywood; others start Downtown. Lots of comedy clubs around L.A. have free comedy shows. Some, like The Comedy Store, still require a minimum drink purchase at free shows, but others, like the Upright Citizen's Brigade or M.i, Westside Comedy, don't. If you get on their email lists or follow them on social media, especially Twitter, you'll get announcements of free shows. Some have free advance tickets, but many are first come or lottery. You can also check Goldstar.com for free comedy tickets, but there's a processing fee that is sometimes more than the $5 admission charged at some other shows. Listen to Free Music in L.A.
L.A. has free music playing all year long, from the Santa Monica Pier to downtown L.A., Pasadena and Long Beach. During the winter, more of the music is indoors, at shopping centers, coffee houses and of course, bars, but there is also still music regularly in winter on the Santa Monica Pier, Third Street Promenade and Venice Beach, as well as other special events. During the summer, free music is everywhere, with many public plazas and outdoor amphitheaters offering free concerts all summer long. Not all of the summer music series in Los Angeles are free, but lots of them are, like summer music at LACMA or music at La Cañada Flintridge's Descanso Gardens. With 4,000 acres of mountains and canyons right in the middle of the city, and a couple more mountain chains surrounding the Greater Los Angeles area, there is no shortage of places to hike in L.A. If you don't have a lot of time, the busy trails of Runyon Canyon are within walking distance of Hollywood Boulevard. The many trails in Griffith Park, including the Hike to the Hollywood Sign, are just a short drive from Hollywood or downtown L.A., and parking is free. Beyond the city, the Santa Monica Mountains and Angeles National Forest offer an abundance of terrains and trails for hiking, but unlike in Griffith Park, parking in the National Forests and Recreation Areas is not free.